Welcome to the collection of my monthly write-ups from our club's homepage, covering all kinds of topics related to Rotary and community service, as well as our club's activities. We may not have met, yet. I don't know where you work or if you are retired. I have no idea if you have children, grandchildren or a dog. I would have to guess your favorite hobby or passion in life. But I can still confidently say that Rotary is for you! I know this because Rotary, and especially the Baldwinsville Rotary Club, has something for everyone who wishes to give back to their community and help those around them. We work with and serve youth, senior citizens and veterans. We help provide food to those in need. Money we raise goes to help support organizations that are making life better in Central New York. We build things in the community. We clean up our trails and parks. If you want to gain leadership skills, we have FREE training. If you want to gain leadership experience, we have TONS of opportunity. If you want to learn new things, the programs at our meetings feature speakers on all topics. We recently learned about beekeeping, drones, charities that provide beds and transportation, and what it takes for your pet to be a therapy animal. We welcomed the police chief and held discussions on how to go green. If you want to have fun, we have LOADS of fun in Rotary. We spent the last eight weeks playing trivia at a local brewery where we sponsored a Trivia for Charity tournament. All teams at that location registered a charity of choice and the top team at the end of the tournament got $1,000 donated to their charity from us (the Rescue Mission got the dough!). We go to plays, sporting events, wine tastings, have picnics together, drink and eat good food, and much more. If you are interested in getting involved, it all starts with a visit to an upcoming meeting or event. Check out the meeting schedule along the right side of this page and choose something of interest. Pick a Tuesday evening or Wednesday lunch meeting, whichever is most convenient. If you aren't comfortable walking into a room full of strangers (because who is, really?) just drop us a line on Facebook or email us at bvillerotary1@yahoo.com to make that first connection. Hope to meet you soon and get started serving others, together! March is an unpredictable month. We never know what the weather will be. Even the "in like a lion and out like a lamb" thing is pretty vague. One thing we can count on is an opportunity to be Irish, whether it's really our heritage or not, and we hope to reap the benefits of their luck. Let's be real though. When it comes to luck, we have to make our own! In a decade of volunteering through Rotary, I've found that the best way to get good things is to give good things. Put the positivity out into the universe and it comes back to you. A boomerang of goodness! Not sure what you can do or how you could get started? In Rotary, kindness abounds! We are kind to one another, we do kind things for others and we talk about the power of kindness. We do small acts of kindness, like buying someone a cup of coffee or making sure to make our charity of choice when we attend meetings (see below). We do big things like pay for a corn mill for a village in Zimbabwe, raise money to help eradicate polio, provide food each Friday to local elementary students at risk of hunger and pay the airfare for two veterans to go on an Honor Flight trip. Imagine all the karma we are banking, how many boomerangs of kindness we send out and how much luck we are making for ourselves! We can make creating luck easy because you can jump into an existing project or program our club already does. You can also bring us ideas on new ways to make a difference. The first step to making your good luck is to visit us at a meeting. This month we welcome several organizations that you might be interested in learning more about and are looking forward to learning more about the Syracuse Chiefs Mets when their general manager visits. Just pop by and introduce yourself or, if you aren't comfortable with that, email us at bvillerotary1@yahoo.com and ask for someone to greet you! Charity of Choice is a program for our members only. Each time a member attends a meeting, they submit a slip indicating a charity that they support. At the end of the month we draw a winner and their charity gets a $100 donation in their honor. Since implementing in December 2018, we have given $200 to Meals on Wheels and $100 to Female Charitable. This was an idea we "borrowed" from another club and is a great way to connect the club with causes our members care about. Another great reason to join our club! Despite negativity sometimes getting more of the spotlight, the demand for opportunities to help others is high. People want to be able to give back, millenials will gladly lend a hand or make a donation, and people around the world are doing amazing things to serve others. In Rotary, our motto is Service Above Self, but that doesn't have to mean volunteering is demanding of your time. It just means that volunteering is in your heart! In the Baldwinsville Rotary Club, we seek out ways to play to our members' strengths. Opportunities with us are not one size fits all, nor are members expected to overextend themselves. If you wish to do the hands on work, we always need volunteers for the day of events and fundraisers. If you wish to take the lead on a project, we are always seeking new and fresh ideas (and we have many opportunities for leadership training!). If you want to make new friends or get to know your community better, attending meetings will help you connect with fellow Rotarians and meet leaders from our area. However you wish to serve, we can facilitate that, expanding your impact exponentially with the power of our 60-member group! The future of service is flexibility and we're doing just that. Contact us at bvillerotary1@yahoo.com if you are interested in learning more! On Saturday, January 26th we join together with the Greater Baldwinsville Chamber of Commerce for a fun fundraiser that includes a polar plunge, Best in Bowl food tasting and Poker Bear Pub Crawl throughout the village. It's a hyper local event that showcases our local businesses and raises money for great causes! Click here for our Facebook event so you can learn more, join and share! Baldwinsville Rotarians develop real friendships and enjoy spending time together, so our fun committee puts together opportunities for members to get together just to have a good time. Coming up for the new year we have a Soup 'n Snowshoe event at Beaver Lake, we will be trying out our detective skills in an escape room and will have our annual paint and sip event. We hope you will consider one of these fun activities for your first visit to our group so you have ample time to socialize and get to know everyone! Save the dates June 14 & 15, 2019 for this year's two-day family festival celebrating life on the beautiful Seneca River. Once again we will host the Food Trucks & Fireworks event on Paper Mill Island for the Friday evening festivities with a $5/person cover. Saturday will remain admission-free with tons of fun for all ages throughout the day, culminating in the Great Seneca River Duck Race. Make sure you plan to join us for our 25th annual community event! Click here to like our Facebook page and stay up to date. Contact us at senecariverday@yahoo.com if you wish to be a sponsor or get involved. "'Tis better to give than to receive," is a common phrase this time of year. The older I get, the more I truly believe it because I enjoy giving Christmas gifts more and more each year! But as selfless as it sounds, we all know that giving to others is simultaneously rewarding to oneself , right? That's kind of an unspoken thing in life, but especially in Rotary, because we don't want to sound selfish. Our motto is "Service Above Self," so Rotarians strive to give to others first and foremost. We don't focus on how we are serving ourselves at the same time, but it's an important thing to consider when looking for a way to fill that need in your life. Service is really the way to go! It feels great to give someone a gift, fulfill a need or even just bring a smile to their face. We do all of that in Rotary through scholarships, supporting the local food pantry and planning acts of kindness in our community. We also do these things on a larger scale with international projects that deliver books to Africa, fight polio in Afghanistan and Pakistan, and promote peace in the darkest of places. Rotarians can be a part of all of that without leaving the comfort of their community, or they can jump in head first and deliver vaccines to babies on the other side of the globe! No matter the project, nor the size of the ripples it sends out, it's rewarding work to serve others. It feels good. It enriches your life. If you are looking for something to do in retirement that has meaning, or you need something worthwhile to do when the kids are at school, or are just ready to commit some of your time to giving back, consider the Baldwinsville Rotary Club. We will provide you with the opportunity to give back all year-round! What are you thankful for this year? Are you thankful for the same things year in and year out, or something new in your life? Baldwinsville Rotarians have much to be thankful for with the results of their volunteering so far in 2018, including some of the same and some new activities! -raised thousands of dollars holding local community events to give back to the community with donations that have helped the disabled, local school groups, veterans and more! And we have a lot more to come! We will be delivering food and notes of thanks to the poll volunteers on Election Day. We will hawk newspapers to raise money for the Syracuse Christmas Bureau on Dec 7 & 8. We will continue monthly challenges for mini acts of kindness our members are incorporating in their daily lives. We will distribute dictionaries to every third grade student in the school district. And we will have several opportunities to socialize during the holidays to spread cheer, enjoy each other's company and invite new members into our group! Are you ready to join us? It starts with a visit to an upcoming meeting. Perhaps you would be interested in learning more about the American Flag or tasting some local hard ciders - we have both coming up this month! Please plan to join us. All meetings will be at the Red Mill Inn. Now that summer is winding down, cool weather is sneaking into the forecast, leaves are starting to change and the kids are back in school, it's a great time to give back to your community. In Rotary, we have many ways to serve that are grouped into the five avenues of service. But each club is different, so here's a list of the five avenues and what specifically you can do as a member of Baldwinsville Rotary to give back in each area! Service projects and contributions that support our youth. Rotary activities that celebrate the professional skills of members and the community, and recognize the importance of high ethical standards in business. Every few years we hold a Pride of Workmanship Dinner, which gives employers in the community the opportunity to nominate a hard-working employee worthy of recognition at a special gathering. Many members offer up their professional expertise to support club activities, through event planning, communications, understanding legalese and much more. Do you have professional skills you can bring to the table? Or perhaps a degree you don't get to use in your day job and could exercise through volunteering? Activities that give back to the community or raise the funds needed to help others. And we're always looking for new ideas that we can implement as a club! 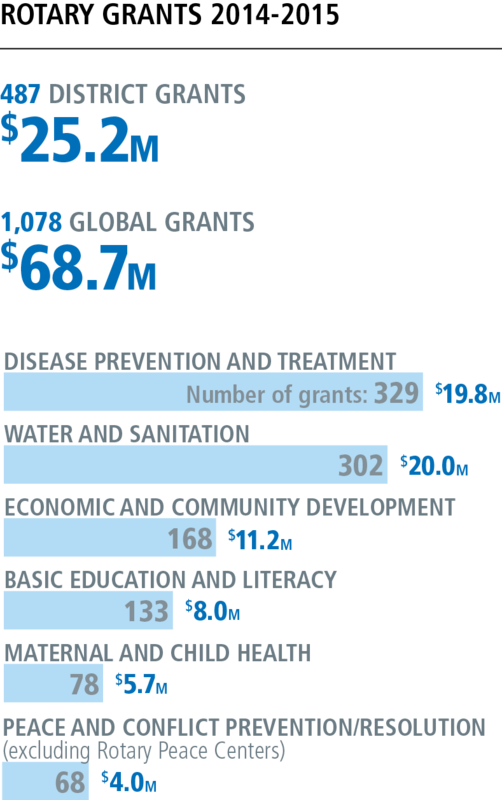 Club efforts to support Rotary International efforts or implement projects that will benefit people around the world. Recently, Baldwinsville Rotary purchased a corn grinding mill to a village in Zimbabwe so they can now mill their own crops, instead of hauling them to another village, as well as help nearby villages. Every year we collect Pennies for Polio in coin jars at local businesses (and with generous donations from our own members) to support Rotary's commitment to eradicate polio worldwide. Since Rotary took on the challenge in 1985, when there were 350,000 new cases of polio crippling and taking the lives of small children each year, we now have only a handful of new cases and are making a push to finish strong in fully eliminating this debilitating and deadly disease from the face of the earth. This has only ever happened one other time in human history (small pox), so you will be hearing more and more as we celebrate World Polio Day on October 24th and get closer to announcing the last ever case of wild polio virus. Right here in Baldwinsville, in meetings held at the Red Mill Inn, you can help people you will never meet in life-changing ways! Activities that ensure an effective and efficient club. In Rotary, we are always looking for and providing training for new leaders. These are skills that carry over into your personal and professional lives too! Not interested in being in charge? Great! We need helpers in many ways - like setting up or taking down meetings, helping with lunch at our Wednesday meetings, taking pictures while volunteering, finding interesting programs to teach us new things at our meetings and more. We have a really amazing club and bringing value to our members' lives through fun, interesting and productive meetings is important to us! 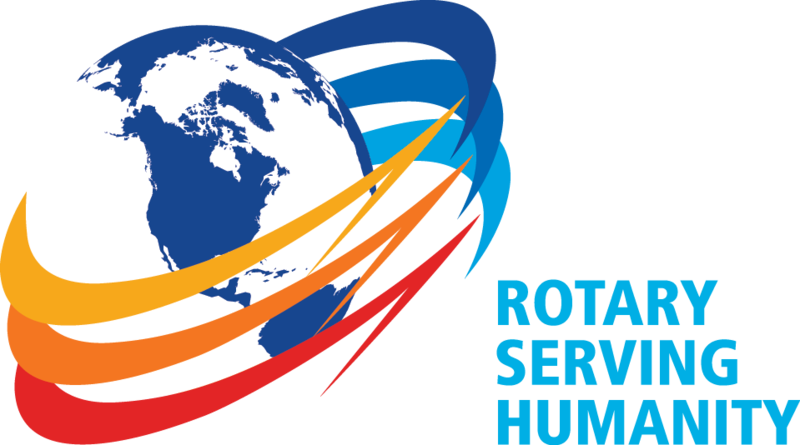 Whether you want to work with youth, help create fellowship opportunities, share your professional expertise, serve people around the globe or make a difference right here in Baldwinsville, Rotary has it all. Plan to visit us at a meeting (schedule to the right) and bring a friend this fall! Happy Summer & Happy New Year! The Rotary year starts July 1, so we have a lot of new things going on each summer. We get new leadership at the club, district and international level and have a new set of objectives to focus on for the next 365 days! Our club welcomes new president Meg VanPatten. She is the head librarian at the Baldwinsville Public Library and has been in our club for four and a half years, leading us with The B'ville Big Chill and taking part on the board for a couple of years. Meg has been active in our community for many, many years and brings a new perspective on how we can work with other organizations to best address the needs of beautiful Baldwinsville. It should be a great year! We are also very proud that this year's District Governor, who oversees 43 clubs in CNY and the Mohawk Valley, is our very own Marv Joslyn. Marv has been a Rotarians for ten years and has been in training for this position for four! He was an innovator when he led our club, establishing our Tuesday evening meeting and growing membership by double digits. The theme for the new Rotary year is "Be The Inspiration," and Marv has many ideas up his sleeve for how we can inspire by being a source of kindness and peace in a tumultuous world. He is reinstating the Passport to Service program, that encourages members to visit other club's events and branch out, and he is introducing Acts of Kindness, to promote spreading joy in our areas of District 7150. He is also planning an awesome celebration in Lake Placid for May 3-5, 2019. Congratulations to Marv - he has the full support of his club, as always! Finally, we welcome Rotary International President Barry Rassin from the Rotary Club of the Bahamas. Barry stepped in after the unexpected passing of Rotary International President Elect Sam Owori last summer and has turned what was a sad situation into a big positive for our organization. He brings great energy to his theme "Be The Inspiration," and a touch of the Bahamas in his beautiful wave in the logo. With 113 years of Rotary under our belt, Barry has a legacy to create for himself, typically accomplished with the Presidential Citation - an outline of goals that reflect the passions of the current RI President. Barry included goals that will engage Rotary alumni - people who first experienced Rotary through a youth program like Youth Exchange, Rotary Youth Leadership Awards (RYLA) or Interact (Rotary for high school students). These are prime targets for potential Rotary Club memberships since they have already seen the good works of our organization. He also wants to grow membership through establishing new clubs in communities that currently have no club or where there's potential to add a second one, as well as through sponsoring Interact and Rotaract (Rotary for college students) Clubs in our districts. In Baldwinsville, we have a lot to look forward to. We've experienced several straight years of membership growth, with many active and inspiring members ready to put Service Above Self. For the summer, we are working on a picnic that will provide a free meal to senior citizens in our community on July 25th, we will hear from students returning from a year of studying abroad about their life-changing experiences in August and we will get to host the incoming Youth Exchange students during their orientation in early September. We are currently re-imagining our annual 5K run/walk to raise money for the Baldwinsville Community Food Pantry too! If you are at all considering joining an organization that will give you opportunities to help others, we invite you to visit us at a meeting this summer. We have such a fun group, that laughs a lot when we're together, and we love to add more smiling faces to work side-by-side with us! You can contact the club at bvillerotary1@yahoo.com to arrange for a visit or check out the meeting schedule on this page and just pop in! As the flowers reach for the spring sunshine and soak up the rain drops, Rotarians start to buzz with work in the community and important fundraising efforts. We did an Earth Day clean-up along the Marble Street nature trail, will be participating in the village Memorial Day parade and many are very busy with planning Seneca River Days. Seneca River Days is our club's original, mega fundraiser, drawing in thousands of dollars for us to give back to the community through scholarships, beautification projects, services for the elderly and veterans, and so much more. Check out the newsletter for a current list of all we've donated this Rotary year! This year's event is returning to the two-day format with a Food Truck & Fireworks event on Paper Mill Island on Friday, June 8th. Admission is $5, which also gets you a duck ticket! Saturday, June 9th we will be at our usual spot in Mercer Park with FREE admission and lots of entertainment and fun throughout the day, including traditions like the Great Seneca River Duck Race, along with new favorites like the treasure hunt and character meet-and-greets. Please like our page on Facebook to get the latest news and updates on the event. We hope you will save the dates and join us for some good, old-fashioned community fun! With all of these things going on in the next two months, now is a great time to get involved in Rotary. You can pitch in all kinds of ways to find something you are most passionate about doing. Working side-by-side with fellow Rotarians is the best way to get to know each other. We welcome you to join us at an upcoming meeting. Please note a couple of our meetings in May are moved to the library, so make sure you check the schedule along the right side of the page! Are Volunteer Groups Doing Okay? You may have heard that volunteer organization like Rotary are fading. Articles pop up in local papers about volunteer groups disbanding, desperate for new members, with bleak futures. While membership in the United States overall is in decline, growth in the number of Rotarians around the world keeps our membership strong. We have 1.2 million members in over 34,000 clubs across the globe. Despite membership challenges in the US, there are signs of growth in our district (which encompasses CNY and the Mohawk Valley) and the Baldwinsville Rotary Club has been growing every year for several years now. When I joined 9 years ago we had 35 members and today we have almost doubled our membership. Thanks to this growth we have added programs like our Backpack Project to provide food for children at risk of hunger on the weekends (done in partnership with the Kiwanis Club and St. Mark's Lutheran Church), we have partnered with the local chamber to provide workers for the annual B'ville Big Chill and we've continued with traditions like Seneca River Days and our annual senior citizen luncheon. There is always something to do in our club! We have volunteered hard over the years to be one of the most organized clubs in the district, implementing a new member orientation program to help acclimate new members to all the ways they can volunteer, keeping our bylaws up to date so the club is modern and flexible, and always trying to keep an open mind about the projects and programs we work on throughout the year. We also place a high value on the social nature of our club and consider it a big benefit to being a member. You get the opportunity to develop real friendships thanks to regular social events, organized by the fun committee. We are always improving and working to do more, but we think we've got a great balance between volunteering and fun that makes being a member of our club truly worthwhile! There are many other clubs in Central New York that are doing the same and have so much to offer. Whether it's mentoring kids, flipping pancakes at a fundraiser, running a fishing derby or working with local veterans, there's a club that is already doing what you would enjoy, or there's a club ready and willing to take on something new! If Baldwinsville isn't close enough to home or work for you, click here to find another club that fits your schedule and location. If our club sounds like a great opportunity for you to get more involved in our beautiful, riverside community, download a membership application or just plan to visit us at an upcoming meeting (see schedule to the right)! Feel free to contact us at bvillerotary1@yahoo.com and let us facilitate your first visit so we can welcome you and make you feel at ease while meeting everyone! I am resurrecting last year's February blog post to re-share this year because it is just so darn good. I couldn't say it any better than I already did, so consider this a throw-back blog! February is a short month that packs a punch. It's when the groundhog pays us a visit, we celebrate Presidents and football, we start to get REALLY fed up with winter (at least here in CNY, anyway) and we show some love to our valentine. We get valentine's from our spouse or partner, our kids and grandkids, coworkers and students, and they all make us feel loved. I make cheesy connections between life and Rotary in this blog quite often, but I'm getting close to jumping the shark on this one. Try to see through the cheese and just believe me when I say that Rotary, when done right, will give you the same warm fuzzies (and maybe even better ones!). Experiences you can have in Rotary will touch your heart in ways you never thought imaginable. Unless you are a doctor, you've probably never had a child thank you for their live-saving vaccine. Rotarians have. Unless you've visited a third world country, you've probably never had someone thank you for providing them with access to clean water for the first time in their lives. Rotarians have. Unless you have a family foundation, you've probably never had a local high school student thank you for making their education more affordable and attainable. Rotarians have. Whether it's serving our senior citizens, veterans and youth locally, or improving the lives of those in need around the world, Rotary provides opportunities to be inspired, moved, humbled and joyed. From seemingly simple donations like a book, to seemingly monumental challenges like eradicating a disease, Rotary gives you the power to do it all! And no matter how selfless you are while doing it, you will reap the benefits of feeling good, feeling loved and feeling blessed to have the opportunity to give back. And of course you could find actual love in Rotary through new friendships that you'll build while working side by side to serve others! So if you want to feel loved year-round, have your heart warmed and overjoyed at the sight of someone else's joy, come to Rotary. Check our schedule (to the right) and choose a meeting, or reach out to us at bvillerotary1@yahoo.com to connect in advance. January is a notoriously cold month in Central New York. It's also scientifically proven that we get less sunshine than the rest of the country and we know we get a lot more snow than most. Put that all together and it can really get you down! Rotary is a great way to stay connected with others, do rewarding activities and just get you out of the hibernation. Whether it's at one of our two weekly meetings, at a social event that we do each month or if you are helping at a fundraiser, volunteering with our club gets you connected with other people. We have fun together, work hard together and relax together. Rotarians often form true friendships so the fellowship extends beyond just Rotary meetings to lunches, coffee chats and visits with one another. That can be really helpful for anyone needing a little pick-me-up in the winter. What our club accomplishes, even in the winter months, is fulfilling work. In January alone we will have a board meeting where we consider donations to support local programs, we will honor two students in our Students of the Month program and we will pitch in (in a big way) for The B'ville Big Chill event on January 20th. The latter is a fundraiser for our club and the chamber - a joint effort that's fun and makes a lot of what we do possible. So skip the hibernation this year and get to a Baldwinsville Rotary Club meeting! The schedule is along the right side of the page so you can see what's on our agenda. Pick a speaker that interests you or a day and time that's most convenient. See you soon and stay warm! This time of year can be a mixed bag of emotions for people. Some feel festive, give more and frown less. Some are reminded of loved ones lost or memories past. Some have been jaded by the capitalism and commercialization of the holiday. Others are able to focus on the true meaning of the season (and whatever that is in their hearts). It is undoubtedly a busier time of year for many, whether you have to finish something by the calendar year, have family coming to town, more parties to attend or preparations for the change of seasons. So why is now the best time to join Rotary? Let me tell you! Rotarians can still turn it up a notch at Christmas, but really we have that internal Christmas spirit all year-round. It's that magic that's in the air when everyone around you is there for all the right reasons, with hearts full of kindness and positive energy, that you can find at our club meetings all 52 weeks. We celebrate the holidays with things like our Thanksgiving Dinner the day before the actual holiday, where we'll be sharing what we're all thankful for this year. We have a club Christmas party and an area holiday gathering with five other Rotary Clubs. And we usually take a break from volunteering the week of the holiday to focus on our families and celebrations. If the holidays are a lonely time for you, it's a great time to make new friends. One of the best things about Rotary are the life-long friendships you will make with people who live right in your community that you've never met before! While working on service projects, enjoying a weekly meeting or just attending a social event, you can't help but connect with people. We all have an easy common ground to start from - we want to help others through service. A great ice-breaker! So don't spend another holiday season feeling alone when our club is at the Red Mill Inn every Tuesday and Wednesday waiting for you! Whether it's Christmas, Arbor Day or just a Friday, Rotarians put their hearts into it. We aren't a religious group, so you are free to be whoever you are and believe in whatever you choose, but we are sincere and genuine people who can get right to the heart of anything. You have to understand the human element in everything if you want to truly serve others who need clean water, education, care or shelter. Volunteering probably sounds like a big investment of your time, which you really don't have during the holidays, but Rotary is getting more flexible all the time. It's not about perfect attendance, but rather about perfect engagement, and what that means to you. If you can't make a weekly meeting, but want to pitch on the day of a fundraiser, we welcome you. If you want to focus on working with youth or seniors and not on fundraising, we welcome you. If you wish to get involved and move up the leadership chain to become Rotary International President, we welcome you. We have a diverse group that already includes leaders, workers, lunchers and committee members. Diversity is important for our club to be successful so feel free to join us at your level, in whatever capacity works for your lifestyle. Oh and bring the kids! We love having kids help us out with projects and to learn service at a young age. So now you can see how the holidays are the PERFECT time to get involved with Rotary! There's a lot going on with you and with us, but we can make it work to your benefit. Make new friends, find new ways to give back and reconnect with the holidays again. September is the time of year when kids go back to school and grown-ups tend to find their schedules slowing down. The weather gets cooler and days get shorter, meaning fewer BBQ's and more down time. It's the perfect time of year to consider volunteering to help others. With the holidays coming, we will hear more and more about those in need and you can be ready to help by being in Rotary! The last few months of the year happen to be pretty busy for our club, with fundraisers, projects and celebrations. Here's what we are working on! Rotary Youth Exchange students have arrived in Central New York from all over the world. They come together after their first few days of school for orientation right here in Baldwinsville. Rotarians from our club host the students in our homes so they have somewhere to stay locally for their weekend of training on how to be great ambassadors. It gives many members the opportunity to meet exchange students that are hosted by other clubs and spending their year in another school district. On the last Friday of September, bikers will take to the streets for an annual fundraiser for The National Center For Missing & Exploited Children. Since the race ends in our community, our club has taken on the responsibility of providing meals for the bikers, including a PB&J sandwich along the way and a hot meal at the end. Thanks to local restaurant owner and club member Dawn, we have the resources and skills needed to pull it off. Several members of the club will volunteer to prep sandwiches the night before and to serve food at the Jones Road Sports Center at the end of the ride. Each November we host a beautiful, autumn race to raise money for the Baldwinsville Community Food Pantry. We've been able to donate thousands of dollars over the years and hope to continuing growing this event. Starting and ending on the school campus, with a course that goes through the Baldwinsville community, it's a great 5K for any level runner and for walkers alike. We put on an excellent event, with nice finisher medals and shirts for our participants, refreshments and prizes are provided after and it's all for a great cause. Click here for more information and to sign up to participate in this year's race. In late October our club will throw itself a dinner party to celebrate our birthday. This year we turn 45 years old! Rotarians will come together for an evening of reflection on our successes, fellowship over some great food and usually some fun and games. Often we will host guests from around the district for this special evening too! Being in Rotary isn't all work and it isn't all play. We get to make meaningful change and improvements in our community, help and serve others, and enjoy ourselves along the way. We hope you will consider visiting us at an upcoming event or meeting! August is Membership Month in Rotary. It's the time of year, early on in the Rotary year, when we focus on how we are going to grow our amazing organization. What can we possibly say to convince someone to give their valuable time in a world where time is so scarce? One thing we can tell you in Baldwinsville is that this is an exciting time to join a service organization. So much new stuff is going on as we meld our traditions with the modern world! So what's new? Rotary Clubs no longer have strict attention policies (if any at all), we offer multiple meetings each week for you to choose from, members can more easily choose their level of involvement and these varied options also impact the cost of participation. Volunteering can fit into your lifestyle easier now than ever! Over the years, our club has worked hard to put in place processes and systems that help new members get involved, familiarized with our organization and just to feel welcomed in general. All new members have a mentor to make them more comfortable joining meetings, introduce them to other club members, help new members find the projects they would be most interested in being a part of and just easing the transition for anyone new to the group. Leadership in our club is a mix of experienced members and newer ones so we are sharing knowledge and club history. We put together great fundraisers and events to serve our community that you can jump right in and help with! Currently, our club is working on brainstorming sessions to generate new and out-of-the-box ideas for how Rotary can be better. This kind of open-mindedness is happening at every level of Rotary as we strive to find efficiencies in running clubs and more effective ways to improve the world around us. New members are encouraged to bring new ideas to their clubs! If you've thought about getting involved by volunteering in your community to help others, we hope you will consider Rotary. You can set aside any and all preconceived notions or old things that made have made Rotary seem old-fashioned because we are embracing so many new approaches to putting Service Above Self that you might not recognize us right away! July 1st means a new year in Rotary. That's how our calendar works. With each new years brings many new things for Rotarians, including new leaders, new projects, new starts and new themes. This year's theme is "Rotary: Making A Difference." Rotary International President Ian Riseley says that we can make a difference because Rotarians are "people of action." You will see this phrase more and more throughout the Rotary year as we find a way to sum up everything that Rotary does. With five avenues of service, six areas of focus and unique projects across all 34,000 clubs worldwide, it can be hard to tell someone what Rotary is in just one sentence. RI President Riseley hits the nail on the head with "People of Action," because regardless of which activities we do that you are passionate about, we get things done. Whether it's working with youth, providing access to clean water or medical care, working on housing or job creation, promoting peace and cultural awareness, helping mothers and babies, giving more people access to education or eradicating polio - we are getting things done. WE ARE PEOPLE OF ACTION! Are you a person of action? Do you want to actually accomplish things in your community and make an impact on the world? Oh and have fun while doing it? Then Rotary might just be for you. Membership also comes with the responsibility to be honest, kind and ethical in all you do. You will be asked to use your professional and personal talents to enhance the club. You also need to be open to making new friends, because our group is fun, likes to spend time socializing and we joke around a lot. If that sounds like something you'd like to be a part of and you are ready to take action, click here to contact us or just stop into a meeting. Our July schedule is just to your right and you can choose a Tuesday evening or Wednesday lunch to come visit. We hope to see you soon! In it's 23rd year, this family-fun day just keeps getting better and better. We hope you are coming to Mercer Park on June 10th to celebrate our beautiful community on the river! Our goal is truly to make it an affordable family experience that will keep everyone entertained. We have classic cars, food and crafts, live animals and live music, magic shows and hands-on kids projects, treasure hunts and competitions and much more. The Coast Guard Auxiliary will be on hand to teach you more about water and boater safety on the river too! Again this year, meet Paw Patrol and get your photo with them (small donation per photo). We will also have several local mascots, including Scooch and Pops from the Syracuse Chiefs, Fidelisaurus from Fidelis Care and Flavor the Cow from Stewart's Shops. Of course we will have our Anything That Floats contest, where you can build a homemade raft and race it down the Seneca River for cash and bragging rights. We will also have The Great Seneca River Duck Race at 7pm that day. Over $2,500 in cash and prizes are available for the first few ducks that cross the fun-noodle finish line, so make sure you get your duck tickets now or even at the park that day! What we don't have is an admission fee or any alcohol. It's just clean, free fun that's perfect for youngsters and enjoyable for grown-ups too! Please help us keep it that way. 1. Buy your duck tickets. Click here to get them online, get them from your friendly B'ville Rotarian or at Mercer Park on Seneca River Day. While you are supporting our club, you are get a chance (or six) to win over $2,500 in cash and prizes! 2. Plan to have lunch or dinner at Seneca River Day at the Rotary Club's concession stand. 3. And support our vendors, listen to our musicians, enjoy the bounce houses or magician, get your photo taken with Paw Patrol characters, and build something in the Home Depot tent. A great turnout makes it better for everyone involved with making it a fun day, full of activities! 4. Support our sponsors - the local businesses and individuals that have donated prizes, cash and important stuff like fireworks to make this event possible and affordable. Click here to take a look at who sponsored us this year and consider giving them your business! Our club has a lot going on this month with our book club, the Memorial Day parade, our Honor Tree program and preparations for Seneca River Day. It's a great time to get on board, either as a member or supporter of either of the two fundraisers. In it's second year, this new fundraiser is dedicated to serving our local veterans. We sell ribbons for $1 each, tie them to a rope and use the garland to decorate the trees on either side of the Genesee Street entrance to the Baldwinsville Public Library for the week of Memorial Day. It is a beautiful visual tribute to those who have or are serving our country. Each ribbon contains a message from the buyer honoring, remembering or thanking a service member. Many thanks to Rotarians Marianne and Joan who are making this happen, and to all the businesses supporting us by selling ribbons for us. The more ribbons we sell, the more we can decorate the trees and the more we can provide needed services to our military veterans! Make sure you look for the Honor Tree during the Memorial Day Parade! In it's 23rd year, this family-fun day just keeps getting better and better. We hope you will save June 10th to be at Mercer Park with us to celebrate our beautiful community on the river! 1. Be a sponsor or donate a prize. Click here for details and see how we promote our sponsors. 2. Buy your duck tickets. Click here to get them online, get them from your friendly B'ville Rotarian or at Mercer Park on Seneca River Day. 3. Come out to Seneca River Day and support our vendors, listen to our musicians, enjoy the bounce houses or magician, get your photo taken with Paw Patrol characters, build something in the Home Depot tent and have lunch or dinner while there. A great turnout makes it better for everyone involved with making it a fun day, full of activities! Click here for details on this year's bands, event sponsors and to buy your duck tickets online. This isn't a fundraiser, it's just for fun. Build a boat to race on the Seneca River from Cooper's Marina to Mercer Park. Have a fun theme with costumes, using recycled materials for your boat and just have a blast! Click here to check out pictures from last year's six participants, get the rules and start building your boat today! April is a time of change. Hopefully the last snowflake is behind us and there are only a few more frosts before the flowers can confidently bloom. We get tulips and daffodils, birds greeting us in the morning, and more and more daylight. Are you ready for something new in your life through Rotary? 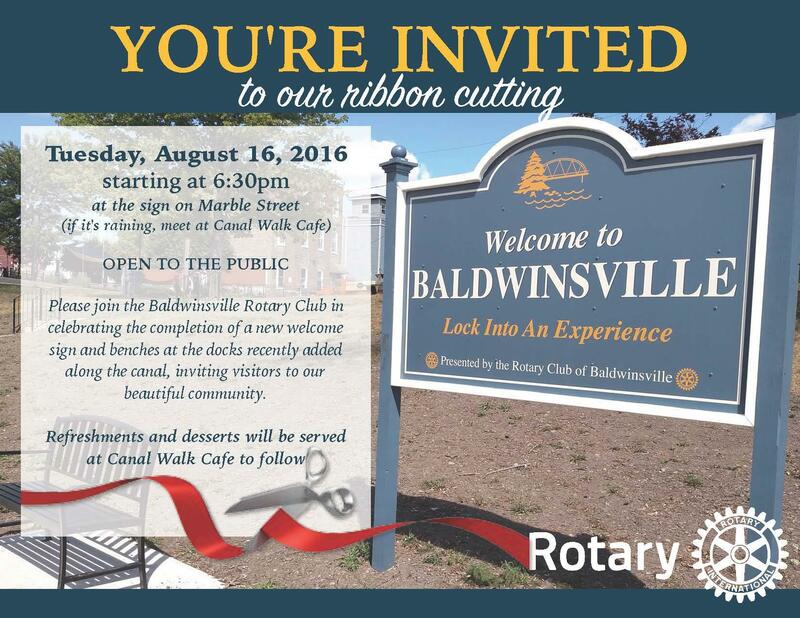 Now is a great time to start in the Baldwinsville Rotary Club. We have many projects and activities coming up that you can get involved in to do good in our community. Tuesday, April 18th we will celebrate Earth Day a little early with our annual Canal Cleanup. We follow that hard work with a dish-to-pass dinner. In May we have a book club meeting that includes a movie night, and our club participates in the community’s Memorial Day Parade. All during April and May we are working hard to put together Seneca River Day, including getting sponsors, duck race prizes, selling duck tickets and booking all the fun for the hundreds of families that will be joining us on June 10th. April is also Maternal & Child Health Month in Rotary. One of the ways that Rotary works to serve moms and children around the world is through our affiliated action groups. Rotary Action Groups are how Rotarians connect to work on different areas of need, but they are not run by Rotary International. The Rotarian Action Group for Population & Development (RFPD) is the group that focuses on Maternal & Child Health. Click here to see the projects they are working on around the world. Each day, over 25,000 children under 5 years old will die from starvation – that’s 9 million children each year. 350,000 mothers die each year from complications of abortion, pregnancy and childbirth. When women can decide when to have a family, they can be more prepared to care for that family. Health education can help women be better equipped for pregnancy. And when women know how to prepare for and care for a family, their children have a better survival rate. Mothers and children in less developed areas of the world face complex issues, including access to clean water, sufficient sanitation, disease prevention, maternal education and healthcare. By working in communities to address their specific needs, Rotarians work to not only provide access to basic necessities, they also work to serve the mothers, young women and children to improve their lives. In the Baldwinsville Rotary Club, we celebrate the beautiful waterway that travels through our village with a family festival each June - Seneca River Day. In it's 23rd year this year, we have already started work to plan our event. Fireworks are being ordered, musical acts being booked, vendors are signing up to sell their wares and Rotarians are signing up to pitch in for our biggest day of the year! Most importantly though, we are seeking sponsors. Would you or your business be willing to support our event? We are looking for corporate sponsors to help fund the fun and entertainment and keep it free for families to attend Seneca River Day. We also need awesome prizes for The Great Seneca River Duck Race! Click here to download a sponsorship flyer and learn more about all the recognition that comes with supporting our event. Click here to learn more about being a vendor at our event too. March is Rotary International's Clean Water & Sanitation Month. With millions of people lacking access to safe water and sanitation, this is a big focus for Rotary. Water and sanitation are at the root of many problems. When families have to travel miles every day just to get clean water, the task usually falls on the women in the family. For young women, that means missing school to provide for their family. A lack of clean water or the proper removal of waste leads to the spread of disease. When schools cannot provide private sanitation, young girls also have to miss a significant amount of school once they reach puberty. Would you be able to focus on work if you had nothing to drink or no where to go to the bathroom? Would your children be as successful in school under those same conditions? It is KEY to improving lives that we start with these basics. Rotary's goal is provide everyone with access to safe water, sanitation and hygiene by the year 2030. Click here to read more about how Rotary has had tremendous success with their approach to tackling this issue. This month, Rotary will turn 112 years old and we celebrate Peace & Conflict Resolution Month. It’s not every day that you can do something locally that will contribute towards world peace. In Rotary, we can support talented individuals to become the peacekeepers of the world through Rotary’s Peace Fellowships. Each year, 100 professionals are sent to Rotary Peace Centers for training, practice and networking so they can become leaders in our efforts to find world peace and resolve or prevent conflict. The fellowship covers all their costs of attending, including tuition, room and board, transportation, etc. Our Rotary Peace Centers were established in 2002 and prepare some of the world’s most dedicated professionals to resolve conflict and foster international cooperation. Settling border conflicts, drafting legislation and providing security are just a few of the jobs Peace Scholars will have. Peace Centers are located in the US, Japan, Australia, Sweden, Thailand and the UK. You can follow our Rotary Peace Centers on Facebook to stay in touch! For many, the holiday season is when they support charities. Bell ringers and soup kitchens are on our minds more at Christmas-time than any other time of year. For some it’s their last chance to make donations for tax purposes too. In Rotary, we focus on giving all year-round. And let me tell you, it’s a great feeling! Imagine the warm-fuzzies you get from buying a coat for a less fortunate child or knowing that your monetary donation will feed a veteran in need, and then imagine opportunities to feel that on a regular basis. How much more fulfilling would your life be? Well that’s Rotary! -almost finished our distribution of dictionaries to every third grader in Baldwinsville as well! Plus, there is so much more to be completed before the end of our Rotary year (June 30,2017). Each spring we have Earth Day clean-up, an Irish Hooley at McHarrie Life to entertain seniors, we award three scholarships to high school seniors, we will celebrate and remember our military service members with the Honor Tree program again…the list goes on and on. Between education, community beautification, disaster relief around the world, supporting area senior citizens and working with kids, we have so many different causes. Are any of these close to your heart? With no attendance requirements, flexible dues programs and two meetings each week to choose from, our club is very accommodating. Volunteering doesn’t have to be time consuming. You can choose to lead a group or be part of the hands-on team. This is the new way of Rotary and we would like to extend a warm welcome to anyone interested in checking it out for themselves! This November is a particularly contentious one with our country’s upcoming election, so it’s a wonderful thing that we don’t do politics in Rotary! We do, however, have a great choice for you to consider that is honest, trustworthy and has an amazing track record to boot. Rotary was started in 1905 in Chicago, Illinois by our founder Paul Harris. He banded together with fellow business professionals, rotating whose office they met in, working to improve their city. From those humble beginnings, we have grown to over 1.3 million members worldwide, and have raised billions of dollars to improve living conditions, health resources and access to education for millions of people. Our foundation, the Rotary International Foundation (RIF), was given a perfect rating on Charity Navigator this fall. The way we handle the funds raised by our members and donated from the public is smart, and we keep our costs for fundraising and administration minimal since so many of us our volunteers. It’s a cause that is easy to get behind when you can trust that so much of what is given will get to people in need! On top of all that we do to help others, Rotary also focuses on the individual and that makes membership very rewarding. Rotarians place a strong value on leading an ethical life of honesty, building goodwill and promoting understanding. Honesty and strong values in life and in business can sometimes seem hard to find, but not for a Rotarian. We are part of a network of people who live and work following The Four Way Test. With a focus on having a diverse group of professionals in each club, you can count on connecting with businesses you know you can trust. But it’s not just networking. It’s forming genuine friendships with each other so when you need something, you know who to call and you authentically offer up your expertise in return. Our group also focuses on sharing knowledge and cultures to promote good will and peace through understanding that at our core, we are all people. No matter where we are from, what religion we practice, what job we do – we are people. We connect with cultures through our Youth Exchange program and with each other through larger Rotary functions like conferences on district, zone and international levels. Our network of friendships spans the globe! As a Rotarian you can connect with other Rotarians while traveling, visit other club meetings when you are out of town and so much more! Whether it’s working on a project to help others, putting together a fundraiser so your club can do more or just sharing in each other’s company for fun, you are with like-minded people in a positive environment. What would make you choose Rotary? Is the idea of volunteering scary to you? There are many reasons people might be afraid to join Rotary, but fear not! We are friendly and here to help. Let us help de-mystify some things for you. It's nice that we are always inviting people to visit us at a meeting, but it can be intimidating to show up to a room full of strangers. We get that! If you are interested in visiting us, just reach out in advance. Email us at bvillerotary1@yahoo.com to let us know you want to come and we are happy to facilitate. We will even pick you up from your home or office if you want to carpool. Volunteering can seem daunting because, let's face it, no one has a lot of free time anymore. "Free time" has become an oxymoron! Well that's the great thing about Rotary and our club in general. We have so many activities going on all the time that you will have a big selection of ways to volunteer - working with kids, serving seniors, helping run club business, feeding the hungry, selling duck tickets - the list goes on and on. Pick one, two or ten ways to volunteer. Whatever works for you! Some might be afraid that Rotary is expensive, so let's clarify the costs for you. There are annual dues that help cover the cost of club functions, district functions and Rotary International administration. These are paid each July and can be split into bi-annual installments, with a total of $135 per year (this is different for each club). Each week our club hosts two meetings, so you can choose to attend on a Tuesday night for just $1 or have lunch on Wednesday for $12. At each club meeting we have a raffle and do happy dollars or fines - all of which are optional and just for fun! Members are encouraged to consider the Rotary International Foundation for their annual charitable giving. As we are doing the good works of Rotary in our community, supporting our foundation on an international level supports our work around the world. And our foundation has a perfect rating on Charity Navigator, so you know you will get the most bang for your buck! But just like the happy dollars, this is not a requirement. Hopefully you would be inspired to give when you learn more about what we do. Finally, there are dinners, conferences and events you can opt into attending that can range from $15 per person for a meal to a trip across the globe for an International Convention. So you could join our club and attend every Tuesday, with a happy dollar at each meeting, for less than $20 per month! Finally, there is nothing secretive about Rotary. No secret handshakes or hidden agendas - we promise! 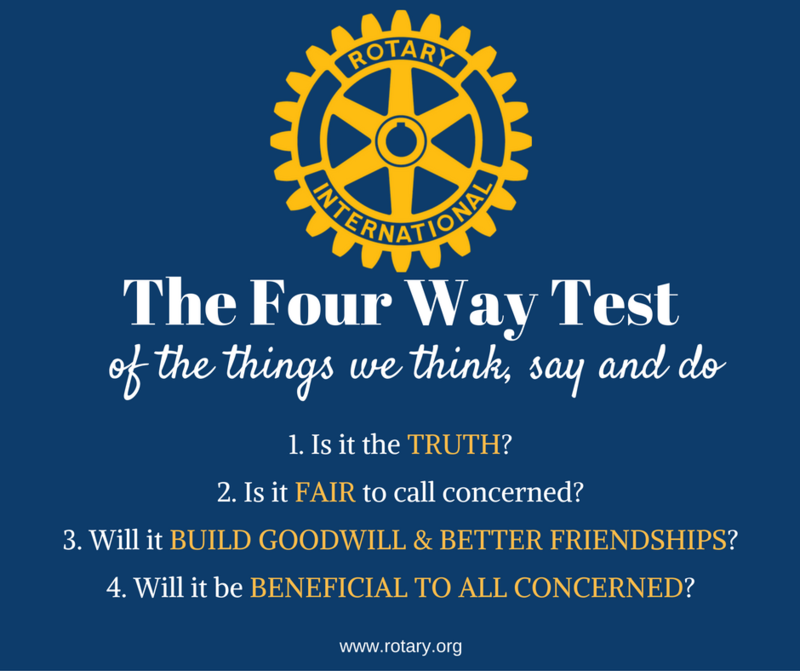 Our members strive to live by the Four Way Test, which encourages honesty and kindness in every aspect of life, and live to serve those around us. It's a very positive environment to be in that brings joy to members of all ages, from all backgrounds and of all spiritualties. Hopefully the idea of volunteering in your community will seem a little less scary now! If you have any questions you can always reach out to us on Facebook or via email any time. Look forward to meeting you soon! September is Basic Education & Literacy Month in Rotary. Our organization does a lot around the world to improve access to education, battle illiteracy and make it a positive experience at every age level. Unfortunately, 67 million children have no access to education and more than 775 million people over the age of 15 are illiterate. It’s a complex issue that includes challenges related to health, nutrition, technology and so much more. Rotary Clubs around the world raise funds for the cause and clubs in areas of need are doing hands-on work to implement programs designed around individual community needs. It’s what make Rotary so successful in all of their ventures! One organization helping fight illiteracy is CNY Books for the World, started by a Rotarian in Skaneateles and now a global effort. Learn more at www.cnybooksfortheworld.org. Just this past spring, Baldwinsville Rotary sponsored two palettes of books to help with shipping costs. We invite you visit us at a meeting this month to learn more about what we do. We are a fun group that likes to make our gatherings light, friendly and productive. You can read more on our About Us page, email your questions to us at bvillerotary1@yahoo.com, but the best way to understand what we do is to just come by! On Tuesday, September 20th at 7pm, we invite you join us at the Baldwinsville Public Library to learn more about our long term Youth Exchange program. The club is seeking student applicants who are interested in studying abroad during the 2017/18 school year. We are also in need of a host family for our student, Matt, from the Netherlands for the last leg of his stay this coming school year. Has your child expressed a desire to travel and learn? 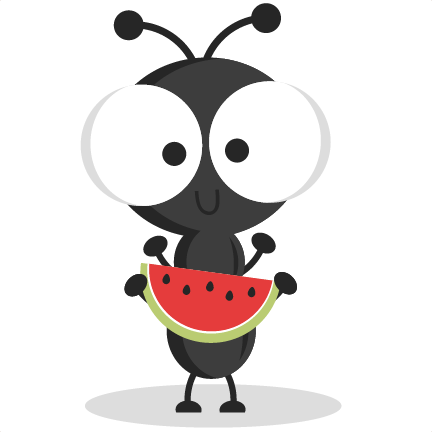 Would you family welcome learning about a new culture by inviting a charming and fun young student to stay with you? Our info night will help you understand the process of studying abroad and what is involved with being a host family. Experienced host families will be leading the event, sharing their stories of how rewarding it has been to host for over a decade now! Join our Facebook event for the latest news and information on this special event. Each month Rotary has a theme to help us focus our efforts in serving humanity. This month is Membership Month and that takes on several different efforts - growing membership, pride of membership and improving membership. Of course, we would like to start by inviting you to join us! We are seeking individuals who live or work in our community and are interested in helping to improve it, or perhaps someone who is looking to serve humanity on a global scale. We do both and everything in between. To be a Rotarian you must be prepared to be honest, kind, open to new cultures, willing to lend a hand and ready to make many new friends. We truly have a fun time planning our fundraisers, implementing projects and just socializing together. The first step is to let us know you are interested, so shoot us an email at bvillerotary1@yahoo.com today! It’s important that as Rotarians we tell others about the good work we do here and around the world. Members should take some time this month to reflect on what makes Rotary important to them. In today’s world, free time is virtually a thing of the past. What makes you so committed to service that you carve out a space for Rotary in your life? Whatever that may be could become an inspiration to others, so share it. Tell a neighbors, post it on Facebook or tweet it from the mountaintops! Make sure you wear your Rotary pin with pride. Members should consider wearing a pin or some form of the Rotary wheel every day. It can spark some great conversations about what we do. Once you have joined Rotary, it’s important to club leadership that you have a positive experience, find something to be passionate about and that you feel welcome. During Membership Month we should all consider how we could make Rotary better for those around us – because of course we want to keep them coming back for more! Are we being inclusive? Are we open to new ideas or ways of doing things? Do new members feel informed? Are we providing opportunities to move “up” in Rotary with leadership training and informative workshops? It’s important that everyone can speak the same Rotary language or they will feel excluded, so be clear in your meeting or conversations what you mean when you say RYLA or DG or PHF.